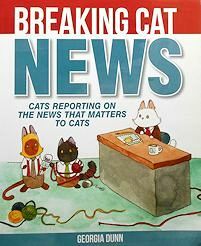 Three adorable house cats set out to provide the most up-to-date news stories relevant to cats (according to them). Headlines feature updates on the food bowl, new plants, mysterious red dots, strange cats in the yard and The Vacuum. Color illustrated comics tell the story. Copyright 2016, paperback, 123 pages. The book is 6 1/2" wide x 8" high. New.